At Kensington Palace, besides the young royals the Duke and Duchess of Cambridge and Prince Harry, several elder cousins of Queen Elizabeth still live there. The most well known are the Queen’s cousins – the two brothers, The Duke of Kent and Prince Michael of Kent, along with their wives, who have both lived at Kensington Palace during their long marriages. And there is another cousin, the Duke and Duchess of Gloucester who also live at Kensington Palace. But who are these cousins and how are they related to Queen Elizabeth? Just a quick glance at the family tree to understand it all – Queen Victoria seen here with her three heirs – just as Queen Elizabeth will one day soon take a similar picture with her own three heirs. Pictured here is Queen Victoria’s first born son, King Edward VII, who reigned for just nine years – he held the title of Prince of Wales for longer than anyone, although Prince Charles will probably beat that claim. Edward was married to the beautiful Queen Alexandra from Denmark. Her sister was married to the last Tsar of Russia. Edward and Alexandra lived mostly at Sandringham – the large, sprawling estate located at Norfolk. Also pictured is Queen Victoria’s grandson, George V, a second son who after the death of his older brother, Eddy, became the heir. George is Queen Elizabeth’s grandfather. And in Queen Victoria’s arms is George’s heir, the future King Edward VIII, who gave up his throne for his love of Wallis Simpson. When he gave up the throne, Queen Elizabeth’s father, a second son, became the King instead. There is no doubt that Queen Victoria could not have imagined that the baby in her arms would not be King, giving it all up to marry a divorcee instead! Sandringham Estate – located on 20,000 acres in Norfolk, England, the house was purchased by Queen Victoria for her son, the later King Edward VII. At their marriage, Alexandra or Alix as she was known, was quite the beauty and Edward was somewhat handsome. Queen Victoria of course was in her widow weeds and is staring at the bust of her late husband, Prince Albert. Just a tad macabre. Edward VII and Alix – much later in life. Alix was from Denmark and her sister married the Tsar of Russia. During the Russian revolution, the Tsar, along with his wife and all of their children were assassinated. Their brother became the King of Greece. Through his granddaughter, who was the mother of the two Kent cousins of Queen Elizabeth, the Kents are double cousins on both sides of the Russian royal family. It’s complicated I know! There are so many cousins who married cousins, that most royals are related in some way. King Edward VII and Alix had six children, the youngest, John, died after one day. The heir to the throne, Eddy, is pictured in back between his mother and sister – he died before he was crowned. Their second son, became King George V, grandfather of Queen Elizabeth. One daughter, Maud, became Queen of Norway. Love the wicker chairs they are sitting on! So chic! The couple, Edward and Alix were said to be happy, but Edward had a large number of mistresses, which his wife chose to ignore. The most famous mistress was Alice Keppel – on Edward’s deathbed, Alix invited Alice to come say “goodbye.” Most interesting is Alice’s great granddaughter is none other than Camilla, Prince Charles’ wife. There are rumors that Alice Keppel’s daughter was actually the child of King Edward, but this was never proved. If true, that would make Camilla and Charles cousins! Both Charles and Camilla are fascinated by the Keppel connection and Charles has apparently tried to buy jewelry that the King bought for Alice – to gift to Camilla. Aw, how romantic! Edward and Alix had five living children and his heir was Eddy – or Albert Victor. Eddy never became king, he died when he was only 28 of pneumonia at Sandringham – soon after becoming engaged to be married to Princess May of Teck. You may remember May, or Mary as she became, was one of the last royals to live in the state apartments at Kensington Palace with her parents. Mary’s mother was a first cousin of Queen Victoria. Eddy, or Albert Victor as his proper name was. He died before he became king. The rumors about his life became pronounced after this death. He bears a striking likeness to Queen Elizabeth’s cousin Prince Michael’s son Frederick. Lord Frederick Windsor, whose parents Prince and Princess Michael live in the Kensington Plaza apartment next to Diana’s former one. Freddie bears a striking resemblance to his great great uncle Eddy. The doomed Eddy was rumored to be unintelligent and possibly mentally ill and also to possibly suffer from a venereal disease. He was rumored to be homosexual, to have been involved with his tutor, and to have possibly been Jack the Ripper. There wasn’t much Eddy wasn’t rumored to be – after his death when he couldn’t defend himself. His reputation suffered greatly and not many of the claims were ever proven true, he certainly wasn’t the Ripper. At worst it is said, he suffered from bad tutoring. After Eddy died, Princess Mary became engaged to his younger brother, the now heir to throne, George, who became King George V – grandfather to Queen Elizabeth. Since George V was born a second son, he was not groomed to be King although he was definitely better suited than Eddy would have been. After Eddy died, George married his fiancee, Princess Mary of Teck, shown here on their wedding day. These are the grandparents of Queen Elizabeth. And here are King George V and his Queen Mary with all their children, who are the aunts and uncles of Queen Elizabeth. This family was very similar to his parents – Edward VII and Alix. Both had six children, with the youngest, a boy named John, who died early. Also, their first born son, the heir, didn’t reign. Eddy died before he could, and then Edward VIII gave up his throne for love. Edward VII’s son John died in infancy, while George V’s son John died at age 13. He suffered from epilepsy and is called the Lost Prince. John’s story is quite tragic, he suffered his first epileptic attack at age 4. 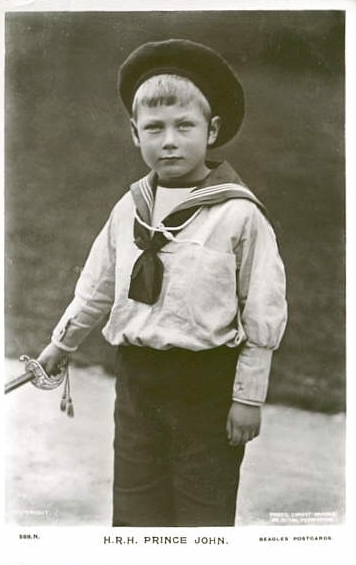 He lived with his family as a true son for a few more years, but as the epilepsy grew worse, he was removed from Sandringham to go live with a nanny and tutor in a small house on the estate away from the family. His parents never once visited him there. His only companion was a young asthmatic girl who was also sent away by her family. His epilepsy was uncontrolled and the family felt it was a “release” when he finally passed away. His companion – the young asthmatic girl - told quite a different story in her old age. She remembered John as being perfectly normal despite his attacks, and she said he was great fun and playful but terribly lonely after being abandoned by his mother and father and siblings. In 2004, a TV movie was made about John and it is very well done. HERE. King George V and Queen Mary at the wedding of their second son, the future King George VI and his bride, Elizabeth – the future Queen Mother! The Queen Mum is standing next to her parents. Queen Mary looks so much like her granddaughter, Queen Elizabeth. King Edward VIII, King George VI, Mary, Henry – Duke of Gloucester and George, Duke of Kent. It is from these uncles and aunts of Queen Elizabeth whose children now live at Kensington Palace. Henry, the Duke of Gloucester’s second son Richard currently lives at Kensington Palace and also has a country estate. George, the Duke of Kent’s two sons both live at Kensington Palace. The eldest son, The Duke of Kent and his wife Katherine live in Wren House at Kensington Palace. They also rented their country house Anmer Hall on the Sandringham Estate from the Queen in 1972-1990. Anmer Hall is currently being renovated to be the country house of Prince William and Kate. And then, his brother, the second son of George, Duke of Kent, is Prince Michael and his wife Marie Christine. They also live in Kensington Palace – in the apartment next to Diana’s former one. They also owned a country house – Nether Lypiatt, which they sold in 2006. The two brothers who now live at Kensington Palace – with their parents, The Duke of Kent and his wife and their sister, Princess Alexandra. The Duke died just a few years later in WWII. The baby – Prince Michael - was born on July 4th and his godfather is President Franklin Roosevelt! The story today centers around Prince Michael shown above as a baby and his wife Marie Christine and their apartment at Kensington Plaza along with their country house Nether Lypiatt . She once described Princess Diana as “that silly girl next door” saying she was “just a convenient womb to bear Charles heirs and he never loved her.” Diana’s loveless marriage made her a “bitter, nasty and strange woman.” She also said “Charles was and remains deeply jealous of Diana’s popularity.” Whew – tell it like it is Marie Christine! A few years ago while having dinner in NYC, she told a group of African-American businessmen to “go back to the colonies” when she deemed them too loud. (What exactly does that even mean?) Her speaking engagements in the states came to standstill after that event. Princess Michael was born royal and is related to almost every member of European royalty through her ancestor Charlemagne. She claims this is because all royalty intermarry. When Lord Mountbatten, acting as his cousin Prince Michael’s matchmaker described Marie Christine to the Queen, Elizabeth retorted “Well, Dickie, she sounds a bit too grand for us.” Indeed. Marie Christine is more royal than all of the British royal family. For all her grand airs – although born in Germany – Marie Christine was actually raised in Australia with her divorced and penniless mother who had left Europe during the war – and who also worked as hairdresser, a quite non royal job. Marie Christine’s not so wealthy childhood left her with a hunger for money and this has caused much of her bad press. Princess Michael’s full name at birth was Baroness Marie Christine Anna Agnes Hedwig Ida; née von Reibnitz. She was already married when she first met the Prince, but she had it annulled so that she could remarry into the British Royal family. Her Catholic religion kept her from being totally accepted though and Prince Michael gave up his succession to the throne to marry her because of her Catholicism. Since Michael is the second son of a Royal Duke, it’s his older brother who inherited all the wealth and who works for the Queen for which he is compensated. Instead, Prince Michael has always scrounged around for money and it is this quest that further gives him and Marie Christine a bad rap. Besides their constant hunt for handouts, these two can’t seem to stay out of trouble. Rumors of infidelity on both sides have plagued their marriage but they insist they are happy and very much together. Princess Michael was once comically caught sneaking out of a London hotel wearing a red wig – while meeting up with one of the Hunts from Texas. The list of her paramours is quite long. It’s not surprising she attracts many men, Marie Christine is the prettiest member of the older royals. She stands 6ft tall with curly blonde hair and has a very beautiful face with icy blue eyes. Additionally, she is without a doubt the chicest of that generation. None of the other royals ever look quite as attractive or as stylish as she does. And being an interior designer, both her houses – the Kensington Palace apartment and her country estate Nether Lypiatt - reflect her great taste. She gave up designing when she married and has taken on a succession of more acceptable “jobs.” She is an author of several books, but again she got bad press for even that when it was proven she had plagiarized large passages in one of her books. Of course! Despite all this – she is keenly intelligent and has a strong personality which many people do seem to like. Her husband is said to be quite funny and very warm and quite amorous as one of his mistresses bragged to the press. The worst of times for the couple though came quite recently. It was discovered they were taking money from a Russian billionaire who paid them for services that no one quite knows how it was earned. Several years ago she was photographed on vacation, holding hands with another much younger, very good looking and very wealthy Russian. She said at the time, “Of course Mikhail finds me attractive and beguiling. Men are charmed by me, and in return I am a very tactile woman. Why can't people show some respect? Years of breeding must be worth something." Though their affair ended, the Russian was found murdered this year, just one week after it was reported about the money the other Russian had given Prince Michael. No one is accusing them of any wrong doing in the murder of course, but it all just sounded very bad. Of course. Princess Michael caught in Italy on vacation with the 20 some years younger Russian millionaire who recently turned up murdered. Just friends? I love how Prince Michael is checking out his competition. Now THAT’S an open marriage! The couple just very happily celebrated their 35th anniversary. Despite all their bad press, there is something to be said about the couple who continually hold their heads up and perform royal duties for England even though the Prince is not compensated for this. Myself, I have always be fascinated with Princess Michael – her outfits and jewelry made her almost as watchable as Princess Diana. But it was her country house Nether Lypiatt that really intrigued me. It is considered one of the prettiest houses in England – a perfect doll’s house – of perfect proportions. A very early picture of the beautiful Princess Michael aka Marie Christine wearing the tiara she inherited from her mother-in-law, Princess Marina, along with the adorable daisy diamond brooch and earrings. The dasiy jewelry was actually once Queen Victoria’s daughter Princess Louise’s who willed them to Princess Marina, the mother-in-law of Marie Christine. A more recent photograph shows Marie Christine wearing gorgeous cabachon aquamarines – in a necklace - and as earrings. Love her hat! She loves to wear big statement jewelry like this strand of beads. At her son, Lord Frederick Windsor’s wedding, Prince Michael wore her famous Cartier Sapphire clips pearl necklace. The clips come off and can be worn as pins. She inherited this from her mother-in-law Princess Marina of Greece who bought the necklace from Cartier. This is usually saved for only the dressiest of occasions. Smaller aquamarine and diamond earrings – and another beautiful hat. She really looks so pretty in light blue. Love this hat with the exotic feathers. Another beautiful hat. The English women must wear hats to many occasions and some of them are not that attractive. But Princess Michael always seems to have the prettiest ones! Want to see what I mean by not so attractive hats? Princess Eugenie, daughter of Prince Andrew and Sarah Ferguson rides in a carriage with Prince Michael. She and her sister Beatrice have the worst hats, always!!! This one looks like a flying saucer or a paper plate – not sure which. Is she serious? And who could EVER forget this horrid hat Princess Beatrice wore to William and Kate’s wedding. The hat became the talk of the internet the minute it was first seen. She later auctioned if off. I’m not sure how you could leave this house with this on your head??? By contrast, Princess Michael’s hats are always flattering and never disappoint. Here she is wearing another pretty hat and a chic coat dress. At 6 ft tall, she is the shortest in her immediate family. She does have just one physical flaw – she is known for her somewhat thick legs. I know, I know – we should all have her “issues.” Her husband, Prince Michael of Kent is very handsome and they make quite an attractive couple. He bears a striking resemblance to both his grandfather, King George V and to his double first cousin, twice removed, the Tsar of Russia. King George V and his grandson, Prince Michael who looked quite a lot alike. And the last Tsar of Russia – and Prince Michael who also look very similar. And more family resemblance: Princess Alexandra, sister of Prince Michael, looks very much like her niece Lady Ella, Prince Michael’s daughter. #4 is Prince & Princess Michael’s apartment, right next to Diana’s at #5. #6 shows P&P Michael’s walled garden which they have landscaped to include a pond. #7 shows Wren House, the separate, but very dressy home of the Duke of Kent and his wife Katherine. 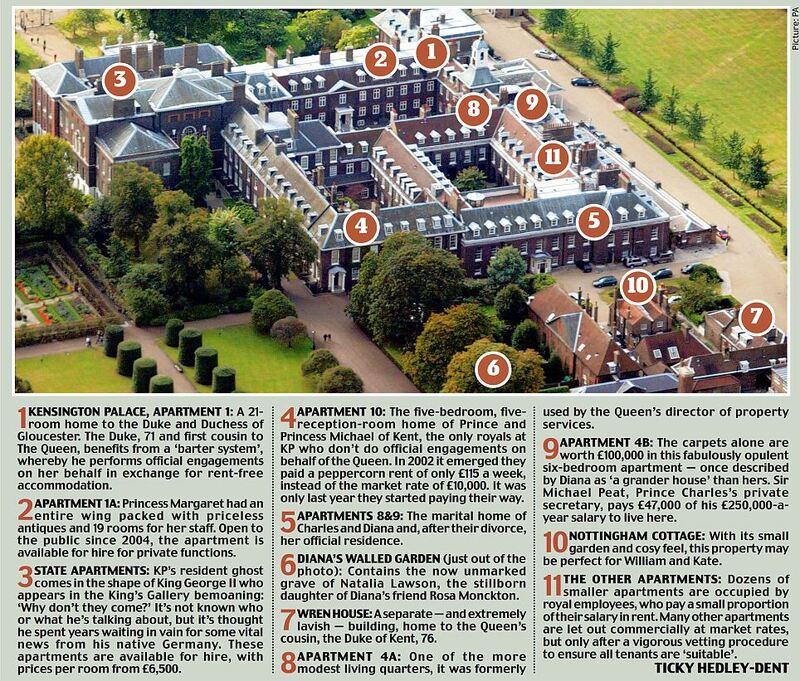 #2 is William and Kate’s new apartment and #1 shows the Duke and Duchess of Gloucester’s house. #10 is Nottingham Cottage where Prince Harry will move once William and Kate move out to their own new apartment at #2. There are a few pictures of Princess Michael’s beautiful apartment at Kensington. It has five bedrooms and five reception rooms. The couple lived here for years, paying no rent. When this was discovered by the press, the Queen agreed to pay 6,000 pounds a month in rent for a few years. Now, Prince Michael must pay over 10,000 pounds each month in rent for the privilege of living at Kensington. Since Prince Michael is a second son and grandson of a King, he is not allowed to receive an income for performing royal duties, although he and his wife both do. Money, and the lack thereof, has been a constant theme in their bad press over the years. The bottom line? It’s hell to be a second son in England! Prince and Princess Michael’s apartment is at the very right of this side of Kensington Palace. – it is attached to end of the building. The long row of windows on the second floor is where the Queen’s Gallery is located. In front is the sunken garden. The Queen’s Gallery as it once looked. Today the paneling is stained dark and the line of chandeliers is gone. These windows overlook the Sunken Garden. The Kents apartment is attached to the end of this room. At the end of the Queen’s Gallery is the public entrance to the State Apartments, here. The row of windows here is where the Queen’s Gallery is. And here, you can see to the right of the entrance is a brick wall – that is where Prince/Princess Michael’s apartment starts. Princess Diana’s is next door to theirs, on the other side. At this brick wall is a door that Princess Diana used to walk through to roller blade in the early morning through the gardens of Kensington Plaza! Here you can see the buses letting out the tourists at the North Entrance. And – you can see Princess Michael’s apartment – where the ivy is climbing on the walls. There really is no picture of the front of their apartment to show. Right behind the bus – behind the brick wall – is the walled garden that belonged to Diana when she lived there. Afterwards, the key was give to Princess Michael who restored the garden for herself. The garden actually goes with her apartment, but when she first moved in 30 years ago, another tenant was using it. Then, Princess Diana got the key – and finally, after waiting 30 years, Princess Michael at last was given the key. And to understand – Princess Michael’s apartment, next to Diana’s and across the Clock Court – Prince William’s new apartment. From this view – you can see the walled garden that Princess Michael restored- with a long pond in the middle and a gazebo at one end of it. The back of Princess Michael’s apartment overlooks the courtyard. And again – Princess Michael’s apartment at the very end of the State Apartments – the Queen’s Corridor. If you look carefully, in the middle you can see there is a black front door with stairs on each side leading up to Princess Michael’s apartment. One question – Why is Marie Christine called Princess Michael instead of Marie Christine, Princess of Kent. Prince Michael is a second son of a Duke. His father was the Duke of Kent who was the son of King George V and Queen Mary. Since Prince Michael was the second son, he couldn’t inherit the title of Duke of Kent. Prince Michael obtained his title at birth. When he married Marie Christine, she became a princess, but since she wasn’t a princess by birth – she takes on the name of her husband. A very rare picture of the courtyard behind P/P Michael’s apartment. As you can see, it hasn’t been landscaped and no one seems to take care of it – which is such a shame. This could really be an asset to the apartments that overlook it, especially with the covered terraced and arches!!! They could put a stone fountain in the middle and fill it with gravel and parterre gardens planted with shade loving flowers. And they could put benches and chairs for people to sit on. What a waste! As it is, Princess Michael only has the walled garden to enjoy – and that’s across from her front door – not connected to her property. Diana and Charles and William in the Walled Garden with its decrepit greenhouse. Diana never really landscaped the garden much – but she used it all the time. And here is Princess Michael in the newly landscaped walled garden with the long, narrow pond in the middle. At the back is a mirror that reflects the garden to make it seem larger. You can really see the pond here. I would have put in gravel paths to and from the pond. Sorry for the terrible press pictures – it’s so hard to find good pictures!! Here is Princess Michael in the garden structure she created sitting on a rattan sectional that is slipped with a pink fabric piped in a darker coral. Cute pillows in pinks and yellows. A recent picture shows the P/P Michaels – at the door to the Walled Garden. You can see their own front door across the street with the iron railing on the stairs. There are just a few pictures of P/P Michael’s Kensington Palace apartment and I spent days and days trying to find as many as I could! Mostly, the apartment is photographed only on occasions when they pose for pictures such as wedding anniversaries and birthdays. Here, from an earlier time, the couple pose in front of their window. You can see the walled garden in the background. 2013. Recently for their 35th wedding anniversary, the couple posed in their Kensington Palace apartment. In his book, Princess Diana’s butler, Paul Burrell, writes about visiting the Kents’ apartment and how elegant and chic it is all in “daffodil yellow.” Marie Christine posed in this pretty yellow lace dress on an antique bench, in front of beautiful sconces and a mirror. In this view – you can see there are two English antique chests on either side of the mirror. The prettiest thing though is her gorgeous daffodil yellow damask wallpaper. It is so stunning and seems to be Fortuny – but not confirmed. Marie Christine looks really pretty in yellow and I’m sure that is why she decorated much of the apartment in that color! The sconces are a rather new addition – maybe brought over from their country home Nether Lypiatt when it was sold. Additionally, I don’t believe that settee is there normally. There is a console that usually sits under the mirror. The settee was probably just moved in for the photoshoot. An older photograph – you can always tell the general age of the picture by the color of Prince Michael’s beard. Here they pose again in the same area, but the settee is pulled over next to an urn filled with dried flowers. Hmm. Those flowers are probably long gone now! There was a matching urn with dried flowers in the other front window before the chests were moved there. Notice that Marie Christine is wearing her other diamond tiara that she inherited from Michael’s mother, Marina of Greece. And she wearing her Cartier clips. 2005. Actually – this yellow damask room is the dining room! The table is moved out for the photoshoots. It certainly is a gorgeous room and I can’t imagine how beautiful a dinner party would be in here. She sits in front of the carved wood mantel. Notice too, the metal cornice over the curtains that is curved inward. Also, you can see the gilt console that usually sits under the mirror as opposed to the settee. The sconces next to the mirror are missing in this earlier photograph and also another pair were recently added over the fireplace, replacing the antique hexagon mirrors shown here. You can see how gorgeous the wood and gilt mirror is here – with a cherub on top. Marie Christine is a rare royal that keeps cats – she’s not much of a dog person. She is always a trouble maker!! 2013. Prince Michael of Kent in full regalia recently posed in front of the fireplace. Here are the gilt sconces that have been recently added. And Marie Christine gets to pose in front of the fireplace too! 2005. Here – the hexagon antique mirrors that were replaced recently by sconces. I actually love those mirrors. The fireplace place is so beautiful – with the bricks inside. And, the fire which is made inside an iron basket. Very English! Here you can see the beautiful carved wood mantel – and see the pot that holds the wood. Is that something that is done in England?. It is such a gorgeous fireplace with its brick interior! Just beautiful! And notice the cane high chair on the left. The walls definitely look like Fortuny fabric to me. Looking at this dining room, it’s obvious that Marie Christine used to be an interior designer. An earlier photoshoot – before the sconces were added. Being painted. Again – notice the beautiful fire in the pot – and also notice the coat of arms behind it. Interesting! Also - the frame around the painting is prettier than the painting almost! It’s so beautiful in cream and gilt. She’s pretty and she knows it! Here, they brought in her chair from her study for a different picture. The dining room seems to be the one place at Kensington Palace where they take all their photographs. Probably because she looks pretty against the daffodil yellow. A yellow Fortuny covered sofa in front of the Fortuny covered walls. Again, I think they just pulled in this sofa from another room because the yellows seems off. Their two children pose on the Fortuny sofa in the dining room. Lady Gabriella Marina Alexandra Ophelia Windsor graduated from Brown University in the United States and has a masters from Oxford. She is now working on her PhD and is a journalist. Smart girl. Her brother is Lord Frederick Michael George David Louis Windsor who is several years older and he and his wife Sophie are expecting a child very soon. Both children are first cousins once removed of Queen Elizabeth. Their grandmother, Princess Marina of Greece, was first cousins with Prince Philip, making them first cousins with him, twice removed! The Drawing Room: In a very early shot of the drawing room – you can see it is blue. There is the same chest that is now in the dining room. The chests were later replaced with much grander consoles. Pretty ribbon back chairs flank the fireplace whose mantel is white marble. Today this room has silk moire wallcovering – still in blue. Of course, with her icy blue eyes, Marie Christine also looks very pretty in a blue room! This rug is still being used, over 35 years now. And while the drawing room is blue, the staircase was daffodil yellow. I love saying that – daffodil yellow!!! In the drawing room – you can just make out what appears to be a gorgeous chinoserie antique chest on a stand. Prince Michael poses here before he grew his beard! Marie Christine is wearing her diamond daisies. In this recent photograph of their drawing room – you can see they still have the same blue rug and the walls are now blue silk moire. The same chest on the stand is in the same position between the windows. One sofa sits on the back wall and two others sit across from it, next to the white marble fireplace. These windows overlook the back courtyard, while the ones across the room look towards the front yard. The apartment seems to be one room deep. A close up in the blue drawing room, showing the curtains and moire wallcovering. A somewhat older photograph of the main drawing room with its blue silk moire wallcovering. The consoles that replaced the twin wood chests are incredible - a carved eagle – and there are two, flanking the fireplace. Here the mantel is white marble. The ribbon back chairs are seen again here. I wish there more color photographs of this room – I searched and searched but couldn’t find many! Marie Christine’s coffee table is a kind of shadow box filled with antique mementos of hers and her husband. I doubt she has to go buy antiques like these – they probably have storehouses filled with things from ancestors. Here is the other matching eagle console table on the right side of the fireplace. The paintings on both sides of the fireplace look like Italian romantic scenes. The Study: Prince and Princess Michael’s study! They each have a desk facing each other. It’s a typical English cluttered mess, but I love it! There’s a stone fireplace and another metal cornice at the window – although this one is straight, not curved. I enlarged the photograph so you can see more details – but it’s a little blurry. Notice the tiny Chippendale styled chair next to the fireplace. And there’s another tiny chair next to the side table by the desk. I’m not sure I would EVER leave this room! So cozy and warm – must be wonderful in the dead of winter with a fire going!!! The Bedroom: In a rare photograph of their bedroom – again in yellow – it looks like the walls are upholstered here. Notice the pillows with her monogram- MC. The attic rooms – this is probably the floor that the children slept on. And Lord Frederick’s bedroom with its antique brass and iron bed. A basement room that is not much to write about. It reminds me more of Diana’s décor than Marie Christine’s. Still, it’s worth showing because you can see through the window how the basement floor rooms are. The ceilings are much shorter down here. Nether Lypiatt or LIP-iatt as it is pronounced. Nether Lypiatt was Prince and Princess Michael’s country house in Gloucester or Royal Gloucester as it is called. Located west of London, this is the area where Queen Mary waited out the war and later where The Princess Royal, Anne, and Prince Charles both bought their country houses. Anne lives at the large sprawling Gatcombe Park and Charles of course is at Highgrove. The Kents bought Nether Lypiatt in 1980 and just sold it around six years ago. Their children were primarily raised here. Royal Gloucester – where Prince Michael and Princess Anne, Charles and Camilla once all lived. Only Charles and Anne remain in their original houses. You can approach Nether Lypiatt from either side. The street is one lane. The sign warns of a cattle grid (we call it guard here!) and horseback riders. A glimpse of the house from the front field. Nether Lypiatt is known as one of the prettiest country houses in England. A perfect square, it is small and very romantic – a doll’s house of sorts. A view of the vast, mostly empty countryside – Nether Lypiatt is where the red arrow is. Entering the property – tourists buses can’t make it down this lane. On the left are the old stables and farm buildings. The outbuildings – some are converted into living quarters and offices now. A glimpse of the house at the very right next to the farm buildings. An early picture of the gates at Nether Lypiatt. P/P Michael bought the house when they were first married. Marie Christine totally restored it back to its former glory. As the house is today – it was built with mauve-grey stone, called "the colour of a guinea-fowl's plumage.” Built in 1703, it is a Grade I Listed Building. Nothing can be altered without express permission first. After all these years, with their children having flown the nest, the couple put the house up for sale. It took almost a year for someone to buy it. At the time the couple claimed they were selling because fox hunting had been outlawed in the area. They were going to buy a house in France where they could hunt. Of course, they never did. In truth, people thought they sold it because they needed the money to pay rent on their Kensington Palace apartment. After living there for decades and paying barely nothing, the uproar from English citizens was huge when it was discovered the Kents were living rent free. The Queen agreed to pay their rent for several years at around 6,000 pounds a month. But, the time came that they are now on their own and they have to pay over 120,000 pounds a year to live in Kensington Palace. Hence, they sold the country house. The Kents hated to leave – Marie Christine said she thought she would leave, only in her coffin. She had plans to create a dower house out of one of the barns for her to live in when widowed – after handing over the keys to her son. But the money was too much of a lure. They justified the sale with their older children now gone and the fox hunt being declared illegal. The paid 300,000 pounds for the house and 30 years later asked 6 million pounds for the house – reducing it once by 500,000. Another titled couple bought Nether Lypiatt. A Lord, the new owner races cars. He and his wife have five children. Look familiar? It is believed the Nether Lypiatt was modeled after this house Ashdown House, built in 1660. Princess Michael got the plans for this house for help in restoring her own, including adding a balcony which had disappeared over the years from Nether Lypiatt. This house was thought to be modeled on Nether Lypiatt – only it’s even smaller. A gravel drive leads up the gates. At the left and right are two pavilions which were added at separate times. The garden side of the house actually has a prettier façade than the front. There are only three pavilions – a fourth should be added to make the house perfectly symmetrical - not sure if the new owners will do so or not. Of course they would have to get permission first to alter the house since it is a listed building. Inside the wall there are parterre gardens planted with lavender. At back is a grove of Cedars of Lebanon, the tree that sold Prince Charles on Highgrove House. Both Charles and Prince Michael were looking at the same time to buy a country house in Gloucester. Marie Christine had toured Highgrove first and turned it down. Charles is said to have actually wanted Nether Lypiatt but lost it to the Kents – something he deeply regretted. More of the gardens at the side of the house. Here, you can see the three pavilions. The lavender in full bloom. The garden side of the house is the prettiest – with the pavilions and their leaded windows. Notice how much prettier the arch of the roof on the pavilions is from this side than from the front. Princess Michael’s office is in one of the dormers in the attic. The basement is at ground level on this side of the house. There was once just one pavilion, another was added later and then a wall was added on the left side of the front façade to create symmetry. Eventually a pavilion was created where just the wall once was. There are additional bathrooms and bedroom in the pavilions. The garden door entrance on this side of the house that leads out to the lawn and rose mazes. Aerial view of the manor. The house itself has the white roof – not sure why? In front are the lavender parterres and the gate, then the gravel drive. To the left of the house are the two large rose mazes. The pretty garden side of the house – with the two pavilions looks over a large green lawn. Next to that is the hidden tennis court. At the back of the house is another parterre garden. The swimming pool is just north of the tennis court. In this view you can see that there are only three pavilions. The north east corner doesn’t have one – I do wonder if the new owners will build one to make the 45’ square house totally symmetrical? At the very top of the property are the old stables and farm buildings which some have become offices and quarters. The new owners – can’t imagine what they are doing! Maybe cleaning the stone? An early picture posing outside Nether Lypiatt. The Kent name is highly connected to the manor still, even though they sold it several years ago – they gave a “royal” connection to the manor that stuck. Here’s an earlier floor plan of the square house. Not sure how it has been changed today. On the first level, there is a double drawing room, a large entrance hall, and a study. Bedrooms are on the second floor and the children’s rooms are on the third. The kitchen and dining room are in the basement. Upstairs the four bedrooms have become two bedroom suites. There are seven more bedrooms scattered through the top floor and in the pavilions. On the top floor – the children’s floor contains a kitchen and a sitting room, along with three bedrooms – all ready for a nursery and a nurse! Another anniversary- the Kents pose outside the front entrance. In the windows you can see the shades. Lady Ella poses outside the front door. The house was photographed for England’s Country Life magazine first in 1923 after it had been renovated. After reading the article, a famous English musician and harpsichord player named Violet Gorden Woodhouse and her husband bought Nether Lypiatt the year after the pictures were published. In 1934, Country Life again photographed the house for their magazine. Here, the entrance hall is seen with dark wood paneling. Violet Woodhouse was a character – she lived with her husband and two others in a sexually open relationship. When one left for good, she stayed on with just two of the men!! After she died, the two husbands remained in the house. Very strange or perhaps – very interesting??!!! There are no known pictures of the entrance hall, but this looks like it might be the room with its white painted paneling. The central staircase – we only have this old photograph, nothing new. But I would suspect Princess Michael painted the wood a light tone. I love the arched alcoves at each landing. The double drawing room runs along the back side of the square house. It is such a pretty room with painted paneling and floors and high ceilings. I love the way Violet decorated it with all the antiques and small rugs. A large bookcase is between the two areas of the room. At the smaller end of the room – there is another large bookcase that runs the length of the wall. Princess Michael covered up this long bookcase with a large tapestry. Violet was a famous musician and you can see the myriad instruments around the room. In the back room – by the window – it looks like a daybed with a canopy is there. And looking towards the large area of the double drawing room, where the fireplace is. This side of the room with the two windows overlooks the “pretty” garden side of the house where the two pavilions are. The landscaping is also designed so that the eye sweeps down the lawn from the windows in this side of the room. Nether Lypiatt has been highly praised in many books – here are two quotes: Harold Nicolson wrote: "I am entranced by the house, which is the only one which we have seen that I really covet." And Hugh Montgomery-Massingberd, author of English Manor Houses, says it is "a most covetable example of that delectable 'doll's house' style of gentlemanly, well-mannered architecture which blended Dutch and Classical influences and flourished from about the middle of the 17th century up to the age of Queen Anne. It's comfortable, relaxing; nothing too flashy or clever." That wonderful mix – comfortable and relaxing – and not too flashy – perfectly describes Nether Lypiatt! Photographed under the Kents – the large side of the double drawing room. The fireplace is so beautiful. The table was commissioned by Marie Christine – Prince Michael’s crest is in the middle of it. Double sofas flank the fireplace. Notice the walls are also painted the same daffodil yellow – just like in their Kensington apartment. I love the arrangement on the right around the mirror. There is actually a third sofa that sits behind the coffee table – the same basic arrangement, again, as in their Kensington Palace drawing room. Another view – showing more of the needlepoint rug. Beautiful moldings and wood work. In 1938, Queen Mary – Queen Elizabeth’s grandmother – was staying nearby at Badminton and came to visit Nether Lypiatt to see its beauty up close. Apparently, much of the furniture that was in the house then was still there when the Kents moved in almost 40 years later. Marie Christine constantly took on projects to update the house. She put in a heated swimming pool and created a rose maze with 2,500 bushes! She painted the dark paneling light and put back windows that had been concreted over to save on the “window tax” – a few windows weren’t replaced though. Instead she faked it with paint and iron to make it appear the windows were added back. The family sits in the drawing room with the third sofa pulled out for the photograph. All the windows have deep seats. The chest on chest behind the sofa has a section that acts as bar. Siting in the yellow drawing in a tiara – just another Tuesday night! Beautiful fireplace! Posing on the window seats – it looks like a silk plaid taffeta fabric is used for the shades. Lady Ella – sits on the same window seat. The painting has a romantic Italian view. Lady Ella stands by the caned fern stand. What a beautiful piece! And for their 25 wedding anniversary 10 years ago – the couple posed in their drawing room next to the chest that doubles as a bar. Love the blue and white porcelains and the clock!! Such a blurry picture – I searched for days to find this clearer – you can see here how the three sofas are arranged around the large coffee table. Behind the back sofa- is the smaller part of the double drawing room. Here’s the smaller part of the drawing room – where there is that beautiful built in – covered up by a large tapestry. The tapestry is beautiful too – not sure why she covered up the bookcase though, but the tapestry does make a huge statement. Below the tapestry there is another cream colored sofa. And of course, they will pose in front of the tapestry! Wish I had pictures without these two in all of them!!! The study is paneled – like the rest of the house. Here it is shown filled with antiques and musical instruments. Love the chinoserie cabinet and the clock above it. And how the study looked under the Kents. Marie Christine kept the wood stained. As usual, she decorates with an assortment of English and French pieces just like in her Kensington Palace apartment. Love the Louis XVI chair. And that chest is so beautiful. Her Serapi is pretty too. The prints were inherited by Prince Michael. The beautiful Lady Ella models in front of the study’s window. And here, she lies on the rust colored sofa in the study. A Christmas Card – not sure if this is from Kensington Palace or Nether Lypiatt - a corduroy sofa sits underneath a hanging screen. The dining room is in the basement – next to the kitchen. Marie Christine hung a set of plates on the paneling which is so perfect. And so beautiful. This reminds me of Axel Vervoordt’s dining room. And – it’s a perfect idea for someone with a very small budget. You could replicate the boxy paneling easily – or have a carpenter do it for you – and then buy a pretty set of French plates from Ebay. Or, just paint the walls darker and hang a set of inexpensive white plates. I’m sure this is an inherited set of plates – in Kensington Palace, in her bedroom – I noticed the same plates in her bookcase. Beautiful!!!! I just love the way this looks. Marie Christine’s dining room reminds me of Axel Verdoordt’s with his fabulous collection of blue and white porcelains found in a shipwreck. He doesn’t have the square paneling highlighting each piece, but it still looks fabulous – good idea to take home with you. A casual picture in the dining room. Even though this is at basement level, the windows are still large and the ceilings seem high. Next to the dining room in the lower level is the country kitchen. Again – deep yellow walls are mixed with dark green cabinetry. It looks like there are stone countertops. I would guess the new owners put in a different, more up to date country kitchen with an Aga. This color yellow is way too deep – like an egg yolk! I like the daffodil yellow much better. On the second floor there were four bedrooms, which Marie Christine turned into two bedroom suites. Violet needed all four bedrooms – one for each of her three husbands. Poor Violet. I can’t even imagine!!! Someone needs to write a biography about Violet, it would sell more copies than Fifty Shades of Grey!!! Beautiful bed and hangings. Again, I love the way she decorated this back in the 30s. Amazing! Violet’s bedroom where the paneling was marbleized. Notice the V in the curtain hangings over the bed. I love the way she decorated her house! After she died, her two remaining husbands kept her bedroom just as it was and left it as a shrine to her. I’ll bet! It’s the least they could do for her!!!!!! The same exact bedroom – now painted green and cream. This is the only picture I could find – sorry it’s so blurry. Pretty mirror and bed hangings. I wish there were more pictures of Marie Christine’s bedrooms! The bedrooms on the top floor are said to be decorated in toile fabric. At the top floor in the dormer window is Mary Christine’s office. As usual it is cluttered with her research mostly likely for her latest book. Pretty rug and chair and desk! But the window is the real charmer here! I wish I had found more pictures of Nether Lypiatt, but this was all of them. Which place would you prefer to live in? The elegant and very dressy apartment at Kensington Palace in the busy and bustling town of London?
. Or would you prefer to live in Royal Gloucester country in a perfectly square doll’s house – all casual and cozy, yet sophisticated at the same time? It’s not even a question for me! Nether Lypiatt all the way! Ralph Lauren’s latest furniture collection is set to debut this fall – timed to celebrate his 30th year designing products for the home. The new collection is called “Apartment No. One.” Sound familiar? Yes. It’s an interpretation of Prince William’s new address at Kensington Palace, although their number is actually Apartment 1A. Lauren says the collection is inspired by the iconic and stylish Duke of Windsor and named for the Cambridge’s new apartment.